"Leave only footprints. Take only photos"
Despite its small area, Ecuador constantly proves itself to be one of the most bewitching countries on the planet. The magnificent cross section of nature, cultures, geography, foods, activities, holiday destinations, people and languages all combine to assert this impressive little country’s status as a must-see destination in South America. Straddled either side of latitude zero, Ecuador never fails to amaze; from the Galapagos Island to the Coast, from the Sierra to the Amazon, nowhere else can one experience such incredible diversity. Maybe I’m biased because I live on the Pacific Coast but, over the last 30+ years, I have traveled through, lived in or visited 45 other countries on this planet, and Ecuador is the one place on Earth that has inspired me to grow roots and stick around for a while. When I began to think about some of the wonderful things I love about Ecuador that I’d be proud to share with people who are thinking about visiting, or even staying for a while, I learned that many of my friends and acquaintances often felt the same way about the same things. Therefore, in the spirit of fairness, before I sat down to write this ten-part series, I asked everyone I know who lives now or has lived or traveled in Ecuador this one simple question: “What is/was the best thing about your experience of Ecuador?” This series of ten posts are all about what they said. At the end of last year, I spent two months traveling around Ecuador. The journey included several fantastic destinations including Mindo, Otavalo, Ibarra, Salinas and Quito. We also visited Baños and Puyo. We went to Galapagos. On the coast, we stayed in the fantastic fishing village of Mompiche. One of my favorite parts of traveling around this country was the bus snacks. There is a vast range of snack available to travelers while moving from place to place, and you don’t have to go anywhere to find them. They come to you. Vendors of all ages, carrying all manner of wares get on the buses and sell. It could be either bravery or stupidity, but we tried everything! At the bus terminals, there were restaurants where we dug into a cheap lunch, stocked up on novel bus snacks, or grabbed an ice cream for a treat. Street snacks were everywhere. At no point during any of our journeys did we suffer from hunger or thirst. On the way to Baños, we munched on roasted broad beans and tried out cheese empanadas; made with green bananas. Riding into Mompiche, we ate llapingachos (yucca and cheese patties) and corviche (green banana filled with fish and salad). Santo Domingo gave us iced coconut water, home-made ice cream and banana chips. As we traversed the length and breadth of Ecuador, experiencing the spectacular train from Otavalo to Salinas, dipping in the Hola Vida Cascada outside of Puyo, and sitting for a quiet hour in the tranquil (and frequently over-looked) tile garden on Santa Cruz, Galapagos, we enjoyed such a diverse range of snacks that it’s difficult to remember them all. The main ingredients of the snacks were beans, bananas, potatoes and yucca. Heading out of Baños to Puyo, we bought potato pies. On our way to Quito we snacked on salty roasted corn nibs. We picked up warm bizcochos with string cheese somewhere between Cayambe and Otavalo. Quimbolitos (steamed corn puffs cooked inside a leaf) were a favorite in Otavalo, as well as large cups of strawberries and cream sold by meandering vendors. Mindo satisfied our chocolate cravings and we visited the Yumbo chocolate factory more than once! In Mompiche, we melted with delight while sampling warm muchin (a banana dessert with cheese, wrapped in a leaf and baked over hot coals), declaring it the best snack of the whole trip. Mama Sara spends her morning mashing lady finger bananas, adding her own magic, and then wrapping it all up into bijao leaves to roast over the fire. In Galapagos, home-made ice cream was our favorite snack. There are plenty of places to grab a cone of pistachio or triple ripple where you can sit in the shade and cool down after an afternoon tour in the hot sun. Everywhere we went, the food on offer was amazing. The street food was incredible, and the bus snacks were impressive. This totally proves that Ecuador is Awesome! Buen provecho. Ecuador is one of the most fascinating countries on the planet. The unique diversity of nature, cultures, geography, foods, activities, holiday destinations, people and languages makes this tiny country straddled either side of latitude zero a definite standout destination in South America. You might think I’m biased just because I have lived here for years, but I have also traveled through, lived in or visited 45 other countries over the last 30+ years, and Ecuador is the only country on Earth that has ever inspired me to build a house and grow roots. When I began to consider some of the great things I love about Ecuador that I’d also like to share with people who are thinking about visiting, or even staying a while, I learned that many of my friends and acquaintances feel the same way about the same things. Therefore, in the spirit of fairness, before I sat down to write this ten-part series, I asked everyone I know who lives now or has lived or traveled in Ecuador this one simple question: “What is/was the best thing about your experience of Ecuador?” This series of posts are all about what they said. We all agree that the markets in Ecuador are some of the best on the planet. 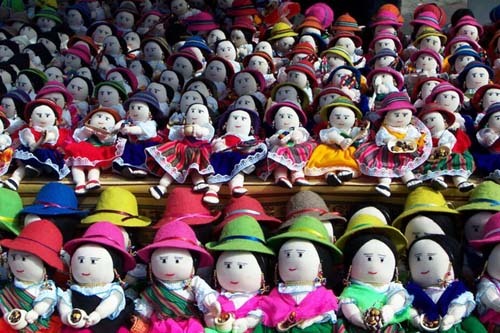 Otavalo’s Indigenous Craft Market has a world renowned reputation and is the Number One destination for just about everyone who visits Ecuador. 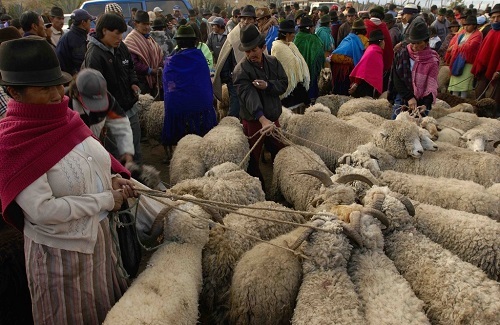 The indigenous Otavaleños are famous for weaving textiles, mostly wool, which they sell at the famous Saturday market. The largest market is held on Saturday; a maze spreading out from Plaza de los Ponchos, and stretching out through the streets all around. You can find is a vast range of brightly colored stalls throughout the market and also explore the local stores. Wandering around the stalls selling handmade blankets, tablecloths, tagua jewelry, musical instruments, dream catchers, leather goods, fake shrunken heads, indigenous costumes, hand-painted platters and trays, purses, clothing, spices, raw foods, and spools of brightly dyed wool just to name a few, can become mind-boggling. A Dutch architect named Tonny Zwollo designed the original Otavalo market in 1970, using ninety mushroom-shaped concrete umbrellas with benches which quickly became known as Plaza de los Ponchos. But fantastic markets are not limited to Otavalo’s famous vegetable-dyed and hand-woven textiles. Many of the nearby villages and towns are renowned for their own particular crafts. The small village of Cotacachi is the heart of Ecuador’s leather industry. In San Antonio, where the local specialty is wood carving, prominent displays of carved statues, picture frames, and intricately carved furniture can be seen everywhere. 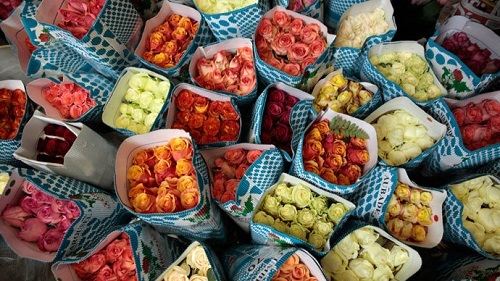 Nearby in tiny villages, rainbows of flowers which are grown for export fill markets stalls and streets with irresistible perfumes. Grown for export, these seconds are sold at the market. 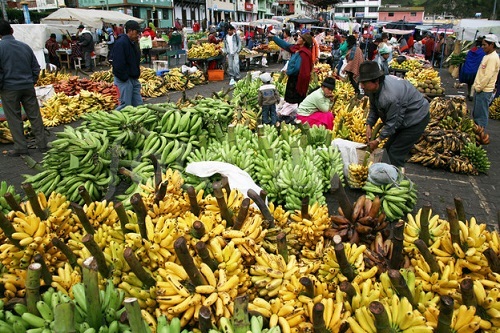 One of my favorite markets is Santa Clara in Quito. On three floors, vendors sell every kind of food you could never even imagine from fresh babaco to pickled pigs feet. There is a section for alternative medicines, rumored to be favored by witches. An entire floor is dedicated to fresh fruits and vegetables. Pitajaya can be found here, alongside the pineapples and dozens of varieties of bananas. Fresh green achocha sits between the snake beans and fresh broccoli heads. Upstairs, sliced octopus nestles beside a bucket of clams. A whole pig roasted over a spit smiles as we pass, beckoning us to come and sample some of the tender meat. Blenders whizz fruit and vegetables into healthy juices. It’s an assault on the senses in every sense, but well worth taking the time to visit for an hour or so. Whenever visitors come to Ecuador, the first place I take them is to Santa Clara where the sites, sounds and smells are an integral part of daily Ecuadorian life. Although much smaller, Cuenca has a fabulous fresh produce market too, with the entire top floor dedicated to local foods. I can recommend grabbing a plate of whatever smells wonderful and digging in. All over Ecuador, there are markets in every town, usually held once a week, where vendors spread out their wares, from cooking pots to pan pipes, earrings to zapotes, live goats to blender blades, and everything else in between. Meeting the locals is definitely an essential part of the entire Ecuadorian experience, and one of the best ways to meet the people who carry the nation on their shoulders is by heading to the nearest market and striking up a friendly conversation. An old woman selling strawberries tells of her childhood in the mountains before electricity and potable water were even heard of in her village. A wizened man carrying a basket of peanuts says that his father used to get up before dawn every weekend to walk into town with the farm’s weekly harvest strapped to the donkey’s back to make it to market in time, a trail of small children tagging along behind. A little girl shows me her new dress, twirling and smiling as proud as can be. The bright dress is hand-made, embroidered by her mother. A lady selling papayas gives me a tip about growing achochas; they don’t like wet weather, she says, you have to plant them when it’s dry. A shy, giggling teenage girl asks to interview me in English for five minutes. It’s for her school project. We talk about my country. 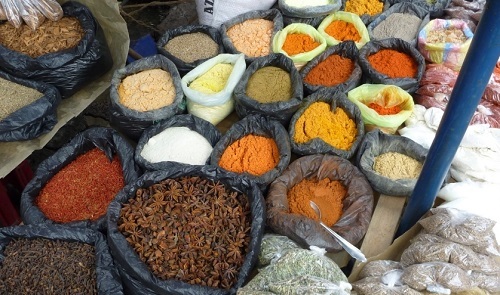 A trip to the market in Ecuador is not just about the shopping. It’s about the experience. It’s about integration and exchanging cultures. It’s about learning more about where you are, and understanding that these people are the essence of what makes it so. If you are in Ecuador, get yourself to a local market. You won’t regret it. For more ideas about what to do while you are traveling in Ecuador, get in touch with Footprints.